America's most popular vacation destination is also the nation's timeshare capital. With hundreds of resorts and thousands of lodging options, Orlando timeshares offer unprecedented opportunities to enjoy a vacation to Central Florida each and every year. With a wide range of Orlando timeshare rentals and resales available now, you can save as much as 70% on your travel solutions. What’s My Orlando Timeshare Worth? Orlando has earned the crown of the best vacation destination in the world, drawing tens of millions of travelers each year. Year-round warm weather makes this Central Florida location worth visiting and revisiting each year, particularly as the colder months set in. With mega-attractions including Walt Disney World, Universal Studios Orlando, and SeaWorld Orlando, an Orlando timeshare is perfect for families, especially those with young children. Timeshare resorts are plentiful in Orlando, as well as in surrounding towns of Kissimmee and Lake Buena Vista. As one of the most frequented vacation destinations in the world, many reputable brands have opened locations in the city, including Marriott Vacation Club, Hilton Grand Vacations, Wyndham Vacation Ownership, and many more. However, the ever-popular Disney Vacation Club takes the cake for top timeshare brand in the area, with a number of massive, family-oriented resorts built right into the Walt Disney World grounds. Are you ready to secure yearly vacation solutions in Orlando at cost-effective rates? Fill out the form on this page to learn more about how Orlando timeshare resales can save you up to 70% on your vacation costs, or call a representative directly at 1-877-815-4227. Pairing your Orlando timeshare with an Interval International or RCI membership will help you exchange your ownership for alternative vacation options. Choose from a range of the best hospitality brands on the planet, with accommodation options including villas, townhouses, condos, and more. Skip those basic hotel rooms for homelike timeshare suites with full kitchens, private balconies, and plenty of space for families. The Greater Orlando Area is home to a vast array of timeshare properties, each one offering a higher standard of vacationing than the routine cramped hotel accommodations also available in the area. Many timeshare resorts in Orlando come along with fantastic on-site amenities that can include shuttle services to major attractions, restaurants and bars, swimming pools, fitness areas, and more. You can't pass up a trip to Orlando without visiting the parks that made the city famous. Head to Walt Disney World for classic Magic Kingdom and Animal Kingdom attractions, enough to fill a week of adventuring. Kids and adults of all ages will also find fun at Universal Studios and SeaWorld Orlando as well. For the shopaholic type, Orlando certainly won't disappoint. In between trips to the parks, you can find fantastic shopping at The Mall at Millenia, which features storefronts from Brooks Brothers, Banana Republic, Crate & Barrel, Jimmy Choo, Macy's, Neiman Marcus, and more. The Orlando area can also double as a great destination for those who prefer to hit the links. The mild climate allows for some of the best golf in the Southeast, which can be found at high-rated Orlando golf courses like Bay Hill Club & Lodge, Waldorf Astoria Club, Osprey Ridge, and more. While the best way to get around Orlando may be by rental vehicle, don't be surprised if your resort offers some sort of shuttle service to theme parks and other attractions. Ridesharing is also a reliable way to get around. Just because you're in Central Florida doesn't mean you can't have beach days! In addition to the variety of lakes in the Orlando area, both the Atlantic and Gulf coasts of Florida can be reached by car in as little as an hour, promising endless days of lunch by the sea. 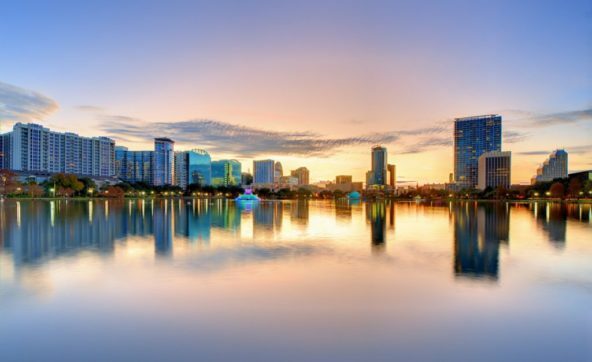 The Orlando area is accessible by Orlando International Airport, which is served by popular airlines like jetBlue, Southwest, Delta, American Airlines, United, and international carriers including, Lufthansa, Aer Lingus, Emirates, and British Airways. No longer using your Orlando timeshare ownership? Advertise it to interested vacationers across the globe. Can't use your Orlando timeshare this year? Add it to our marketplace to help cover your annual costs of ownership. Already Own an Orlando Timeshare?